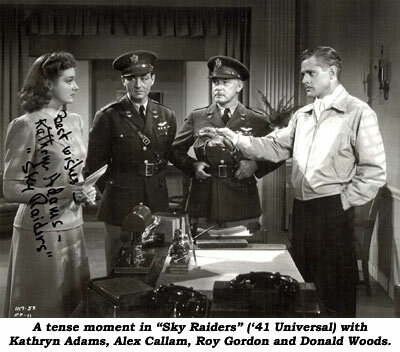 Serial Report Chapter 57-Kathryn Adams, Sky Raiders, John Carroll, Zorro Rides Again, Batman and Robin, Robert Lowery, Johnny Duncan. You have to hand it to the Zorro clan. They sure knew a thing about this blood being thicker than water business. According to the celluloid lore created by Republic in a series of cliffhangers featuring the character—as opposed to the storylines fashioned by writer Johnston McCulley who created the masked avenger in 1919 and continued to churn out Zorro pulp novels for years after this—every generation or so one of his descendents, exposed to some new dose of lawlessness in the community, would feel it incumbent to get out the old mask, whip and black costume from the family trunk and enthusiastically embrace the mantle and swashbuckling deeds of his heroic ancestor. For those who follow these serials the chronology can be a bit confusing. Within the context of Republic studio lore Zorro impersonators show up in a great many time frames and places, from the early 1800s (“Zorro’s Fighting Legion”), to the period directly following the Civil War (“Son of Zorro”) to the later wild west (“Ghost of Zorro”). 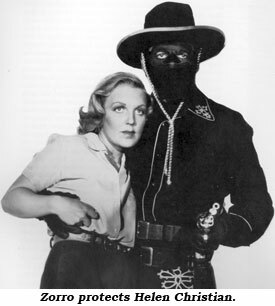 Interesting enough, it was Republic’s first Zorro serial, “Zorro Rides Again”, produced in ‘37, that opted to remove him from his early California setting and drop him right into (then) contemporary times. 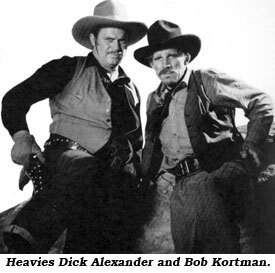 The placing of western characters in an updated modern setting, while jarring on occasion, was not, however, such an unusual move in the realm of B-western film making of the period. Many sagebrush films—those of Tom Mix, Gene Autry and Roy Rogers, for example—were set in the 20th century. Audiences didn’t seem to mind such incongruity and particularly in this instance the updating certainly allowed for the writing team of Barry Shipman, John Rathmell, Franklin Adreon, Ronald Davidson and Morgan Cox to create a wider variety of cliffhanger moments—employing modern weaponry, planes and automobiles—than was normally possible in traditional chapterplays. 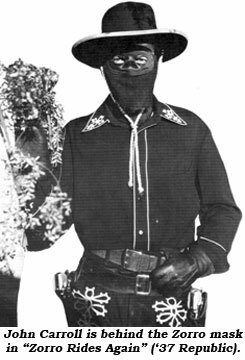 Not only was this Republic’s first Zorro outing—they had experimented with McCulley’s creation, none too successfully, in an earlier feature film, “The Bold Caballero” starring Robert Livingston—but it was also a landmark moment in the history of the genre since it marked the first occasion when William Witney and John English were teamed together by Republic as co-directors, a most fortuitous forging of talent which led to a series of what are arguably the best cliffhangers ever produced. Their union and fusing of styles and directorial approaches was initially a work in progress as they honed their collaborative efforts and further streamlined the product. The robust action and fast-paced storylines that later became immediately associated with the two filmmakers is evident from the get-go in “Zorro Rides Again”. This is a serial marinated in gunplay, hard riding and fisticuffs. The violence—a child is even murdered in Chapter One—is nearly nonstop and Zorro is not so shy about doling out lethal doses of it unlike later serial heroes who tended to reserve their killing shots for the final confrontation. The plot has James Vega (John Carroll) called from his big city job to help his uncle Manuel (Nigel de Brulier) keep control of the California-Yucatan railroad which he owns jointly with Philip and Joyce Andrews (Reed Howes and Helen Christian) and which is under siege by the ruthless Marsden (Noah Beery Sr.), who with his violent gang, is attempting to gain its control. James, who is viewed as an ineffectual weakling, is actually the grandson of the original Zorro and when his uncle is killed by the raiders he vows to avenge his relative’s death by assuming the guise of his fearless ancestor. The cast of “Zorro Rides Again” is first rate though Witney and English probably wouldn’t totally agree with this assessment. In his no-nonsense autobiography Witney is anything but shy about expressing the team’s total disdain for star John Carroll who the moment he signed the contract for the lead role apparently turned into a highly contrary and thoroughly difficult performer. Witney and English simply hated the guy. Fortunately, this evaluation of the actor’s character and slovenly work ethic is not really reflected in the finished product where Carroll accounts himself fairly effectively. His Don Diego is not quite the extreme foppish depiction turning up in later Zorro productions. He is more indolent and bored than sissified but this works quite well and when the chips are down and the mask is on he plays the part with steely and effective grimness befitting the character’s mission of revenge. As far as the action sequences, it is only unfortunate that the screen’s premiere stuntman of the era, Yakima Cannut, who doubled Carroll, was so much bulkier in build than the actor as there is little physical similarity between them and it’s much too obvious when Canutt is on camera. The supporting cast in “Zorro Rides Again”is a strong one although this is mostly in the villain department. For although Duncan Renaldo, later TV’s Cisco Kid, his hair dyed prematurely grey, is effective as Don Diego’s servant Renaldo who shares the secret of his master’s dual identity, Reed Howes and Helen Christian as Philip and Joyce, the brother and sister part-owners of the Yucatan railroad, are excruciatingly bland and forgettable. Not so the two main bad guys, the versatile and seasoned character actor Noah Beery Sr. (who had appeared in Douglas Fairbanks Sr.’s original silent film treatment of the Zorro character) as Marsden, the brains behind the attempts to sabotage the railroad, and Richard Alexander, formerly Prince Barron in the original “Flash Gordon” serial, as El Lobo, his brutal underling. Fleshing out the cast are old reliables Bob Kortman, Jack Ingram, Edmund Cobb, Tom London, Harry Strang, Lane Chandler, Ray Teal and Roger Williams. 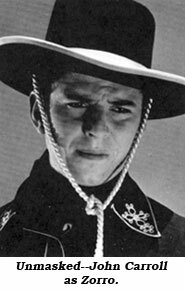 Despite the director’s mutual complaints against star Carroll, “Zorro Rides Again” is a great gift to any fan of motion picture serials. It might be dated in many respects and perhaps not quite as slick as later Republic chapterplays but there’s rip snortin’ action galore, solid directing and some terrific cliffhangers that Zorro must face. 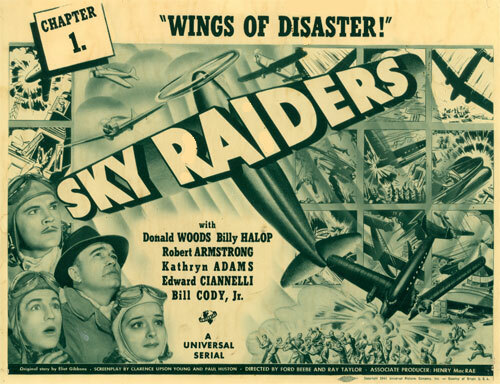 Kathryn Adams, co-star to Donald Woods in Universal’s “Sky Raiders” (‘41), had a brief but memorable career in motion pictures. Born July 15, 1920, in Mankato, MN, she got into movies after entering the Lux Radio Show’s Gateway to Hollywood contest. Although she didn’t win, director Gregory LaCava was one of the judges, liked her, and signed her for “Fifth Avenue Girl” (‘39) with Ginger Rogers, James Ellison and Tim Holt. 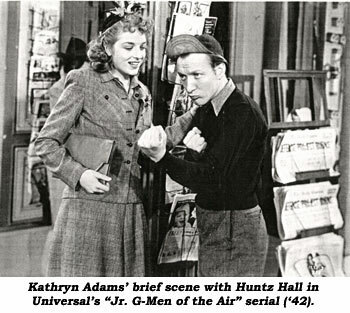 Kathryn left acting in the mid ‘40s and was married to actor Hugh Beaumont in ‘41. She earned a Master’s Degree in Educational Psychology and became a licensed psychologist. After retirement she wrote two books, A LONG YEAR OF SILENCE and WILD ORPHAN. After Beaumont died she remarried and lives today in Minnesota. It’s not easy to do justice to the inspired craziness of “Batman and Robin” (‘49 Columbia). Capable professionals overcame a limited budget to give us 15 chapters of action, if little logic. Much location shooting helped, and there were real trains and planes…and a not-so-real submarine. 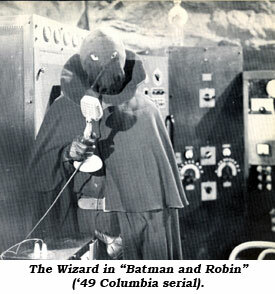 Gerald Mohr, as The Wizard (masked and not billed), pretty much stole the show. Most of his scenes were in a single cave setting, where he strode back and forth throwing switches and turning dials on the remote control machine, and shouting orders at various frightened subordinates. 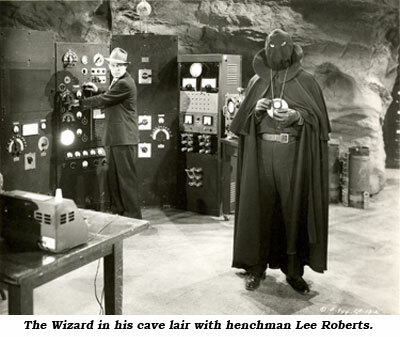 He changed henchmen after unsatisfactory performances; didn’t that also happen in the first “Batman” serial? The rest of a good cast (including Myron Healey in the briefest of bits) walked through their roles with little enthusiasm. Mohr was enjoying himself. Perhaps it was that great toy he used. It could control, and power, anything from planes, to trains, to a simple crowbar. The radiatomic power transmitter in “Manhunt of Mystery Island” was puny in comparison. This was the true universal remote. It even had a built-in televisor, which allowed The Wizard to view events taking place elsewhere. As The Wizard pointed out in Chapter 1: “With this in operation, I’ll be able to control everything that moves, including man himself.” Wow! In that same chapter, Williams, upon learning criminals now controlled his company’s device, cheerfully pointed out that its range was “about 50 miles; we’re working to extend that.” Limited range, and the fact the machine ate diamonds, burning them out after just a few hours of use, were its only weaknesses. Many episodes were devoted to using the contraption to steal more diamonds to use it to…well, you get the idea. A neutralizer, introduced in later chapters, only made things worse. The Wizard discovered that, when operated in unison with the remote control, it created an area of invisibility. He stole the device, and the story changed into an effective chase after an invisible foe. 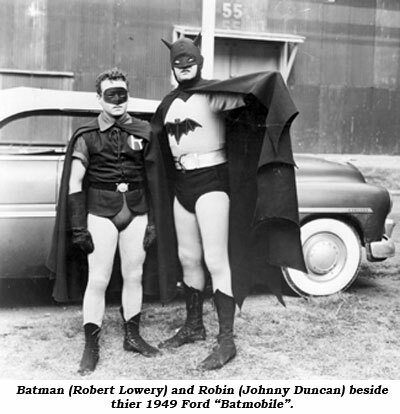 The writers gave the title characters (Robert Lowery as Batman and Johnny Duncan as Robin) a few gimmicks to help them fight back. There was a convertible, whose top could be opened while speeding along in pursuit of a train, without damage. But they had no hiding place for it; when returning to Wayne Manor after an adventure, they just left it in the street and ran inside, still in costume. Nobody noticed. Best of all was Batman’s utility belt. It could somehow produce a pouch of fake diamonds, or inhaler tubes (to counteract gas). It even had a full size cutting torch and igniter. When Batman was finished with them, he simply shoved then back into the belt until next time. Should serials make sense, or should they just be fun? I think Columbia made the right call with “Batman and Robin”.